The Memorial to the fallen of Rhuddlan. Rhuddlan Civic War Memorial comprises, two polished black granite tablets, one above the other; built into the exterior structure of the Community Centre in Parliament Street. The names of the twenty two who fell in World War One are inscribed on the upper tablet, whilst the names of the twelve who fell in World War Two, are inscribed on the lower tablet. In addition there are memorials to the fallen of WW1 in; St Mary’s Church [stained glass window funded by Church Members and a Scroll of Honour to all Church members who had served (The Rhyl Journal of 25th March 1916 reported that a Roll of Honour for all those serving would commenced and hung in the Parish Church) ], the Royal British Legion [RBL] Scroll of Honour inside the Community Centre, and a Memorial Chair to Chapel Members in Ebenezer Chapel Parliament Street. On a more personal note, there is a stained glass window in St Mary’s Church, dedicated by Mrs Bertha Gabrielle Rowley Conwy, to her husband Major Geoffrey Seymour Rowley Conwy killed at Gallipoli in 1915. A brass plaque in the church commemorates Dr Robert W. W. Vaughan MB MRCS LRCP, son of the Vicar, killed near Arras in 1917. Defining Rhuddlan’s population prior to WW1 is difficult because of the various boundaries used in the 1911 census. According to that Census, there was 1607 Civil Parishioners, 1344 Ecclesiastical Parishioners or 1129 people living within the Parliamentary Borough [presumably those eligible to vote]. Of the population, a total of 221 men served in the Armed Forces. Following the cessation of hostilities, thoughts in Rhuddlan turned to the creation of some tangible representation in memory of those, who had lost their lives on active service, during the Great War. The Rhyl Advertiser reported on August 23rd 1919, that in Rhuddlan, the Committee of The Comrades of The Great War, had held a meeting to consider the formation of a comrades club for the town and the purchase of a suitable building. A further report on November 1st 1919, confirmed the setting up of a committee of trustees. 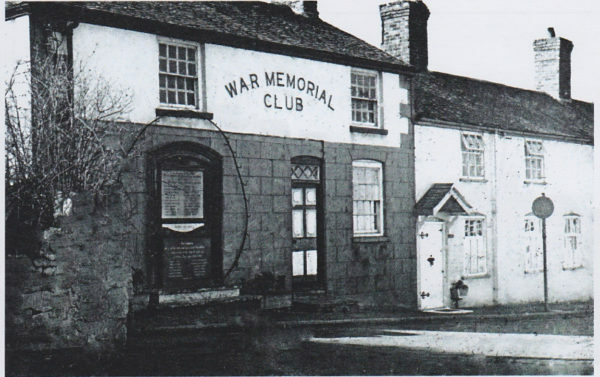 Two weeks later, it was reported that Captain Tudor Jones was the trustee of the proposed War Memorial Club. The management committee comprised; R. J. Jones, William Jolley, Griff Evans, Edgar Roberts, Capt. Stanley Hughes and S. W. Owen [Secretary], together with six members nominated by the Parish Council. In the following weeks letters urging progress appeared in the local press. There was concern that delay would make it more difficult to raise subscriptions, particularly with the economic pressures being felt. By January 1920, The Rhyl Advertiser was able to report that Rhuddlan had plans for a building for the returning comrades to meet up, relax, perhaps play a game of billiards or read a book or a newspaper. In Parliament Street, a reading room and Constitutional Club were already in existence, which it was hoped could be used by ex-service men in the meantime. The old Library [which was then being used as a laundry], the saddler’s shop and a house in Parliament Street, were purchased with a view to converting them in to a “village institute”. By May 1st 1920, it was stated that there was every prospect of starting the work on the recreation room for the comrades. In February 1921 work was completed and by March 12th 1921, the building was ready to be opened for recreational use. However there was no formal opening ceremony until the memorial stone for the fallen was fixed in front of the building. This work completed, the official opening of the Rhuddlan War Memorial Club took place at 3pm on Thursday September 22nd 1921. The service for the unveiling and dedication of the memorial tablet was undertaken by Colonel T. H. Parry DSO MP for Flintshire. The ceremony was well attended by veterans and townsfolk. The Club building comprised a Meeting Room and a Billiard Room, together with other rooms. It was administered by a committee chaired by Mr H. Barnett, Mr Edgar Roberts [Secretary], Mr William Edward Bentley Jones [Treasurer]. The caretaker was Mr James Hughes, an ex-soldier who had won the Military Medal in Palestine. It was noted that the committee hoped to secure extra funding to provide a bowling green. In 1988 plans were made to demolish this building and replace it with a new Community Centre for the village. It was intended that he original granite memorial tablet inscribed with the names of the fallen of World War One, [plus a second tablet commemorating those of World War Two] would be relocated to the new building. Unfortunately they were fractured during removal, so new polished black granite Memorial Tablets were inscribed and designed into the exterior of the new building, as close as possible to the original site.